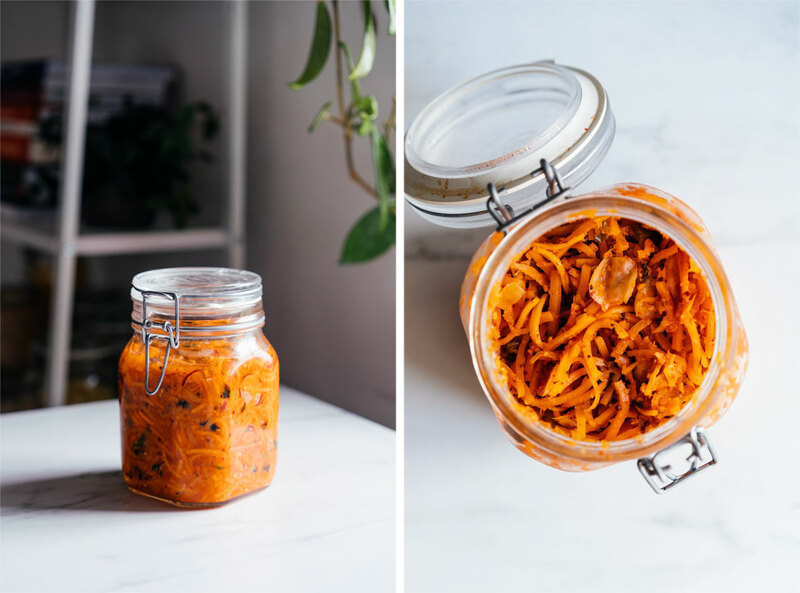 After posting photos of my fermentation endeavours and this carrot kimchi on my instagram I’ve had so many requests to talk more about it and share some recipes. 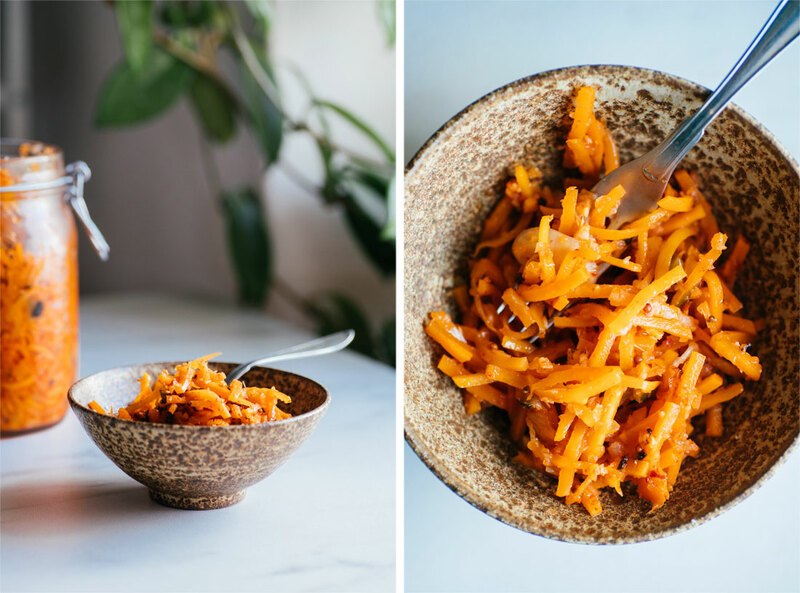 This right here is a super easy recipe, which I’ve actually found most fermenting to be so far in my young experience. It is based on one of the cheapest vegetables we can find and one with the most beautiful colour which brightens up any meal. Don’t you think? 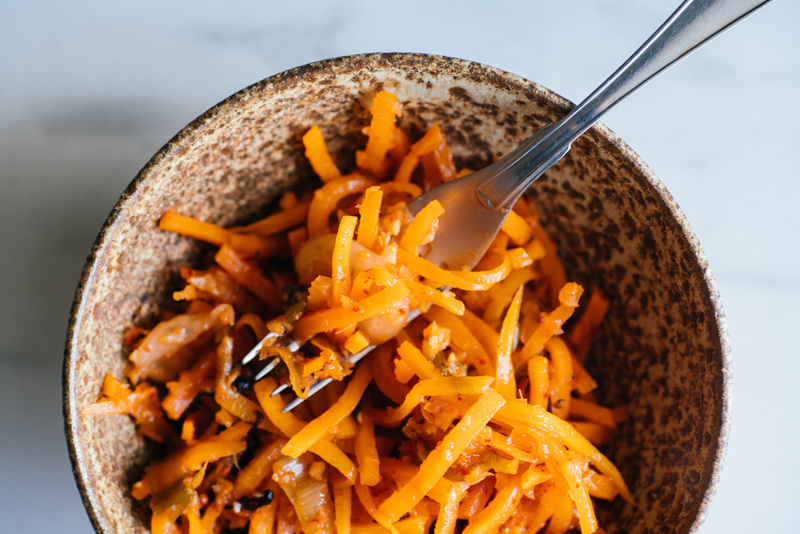 The recipe is based on my own concoction inspired by the traditional kimchi. One substitution I’ve made is swapping the daikon radish to what is more readily available here in the Swedish countryside and that is the little pink ones. In my opinion it works just as well but if you would like to go for a more traditional mixture you can use daikon in the same volume, cut into matchstick shapes. 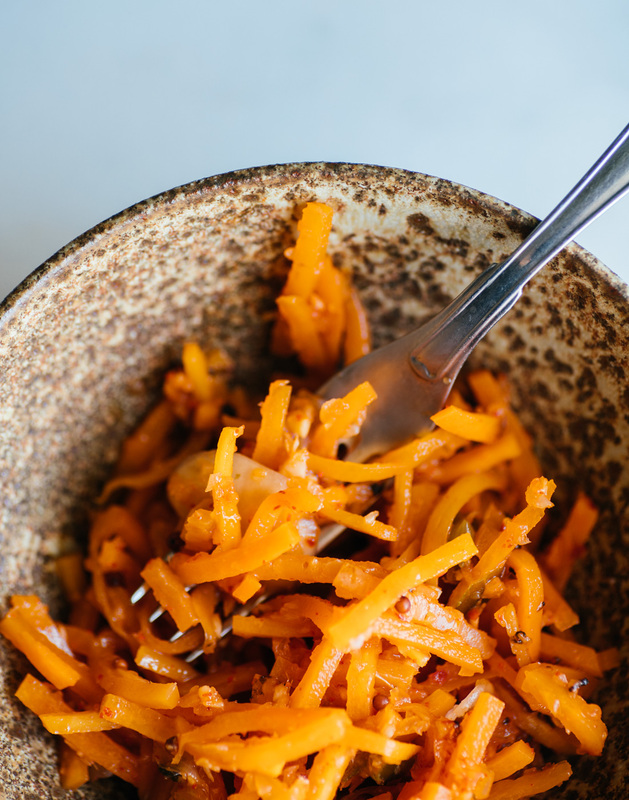 After speaking to my fermenting friend Agata she recommended a short cut to preparing kimchi so I blended my onion, garlic and ginger with salt in the food processor for this recipe. It ended up great and helped getting the juices flowing to cover my ferment. She also suggested trying mustard seed in the mix and so I did and loved it. 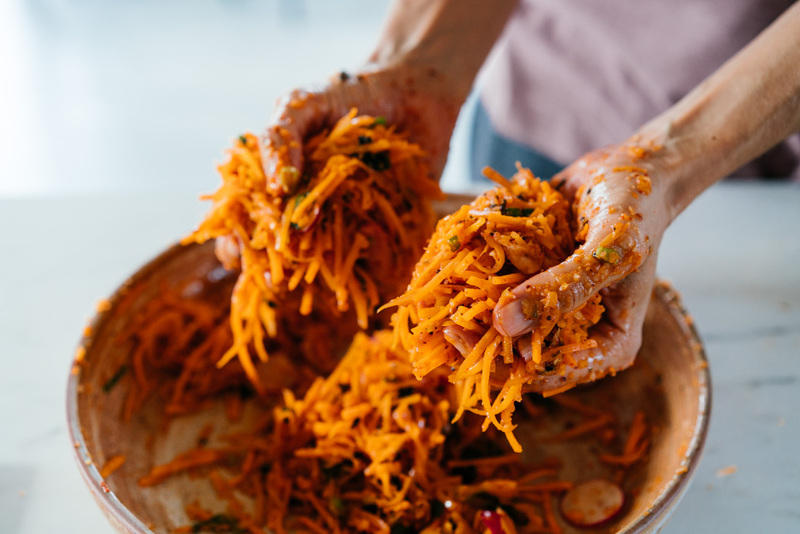 This however is not traditional kimchi practice and you can leave it out if you wish! Finally I’d like to recommend a book before I head out to our garden for some serious cleaning and clearing. Sandor Ellix Katz, ferementation guru to many, wrote a book called The Art of Fermentation and I believe those of you who have a keen interest will love it. 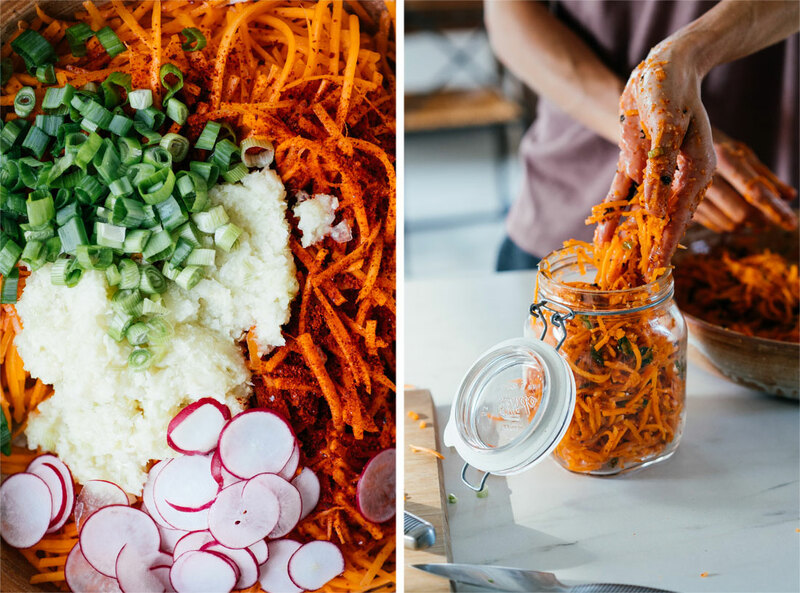 There’s basically all you need to know about fermentation in there with a lot of history and traditions weaved in. 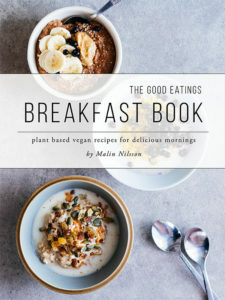 Not all the sections are vegan friendly but I just ignore those chapters and focus on the chunk that does apply to my interests. It’s a great read, guide and fermentation friend. This is my first tip to you guys out there who want to learn more and are curious. 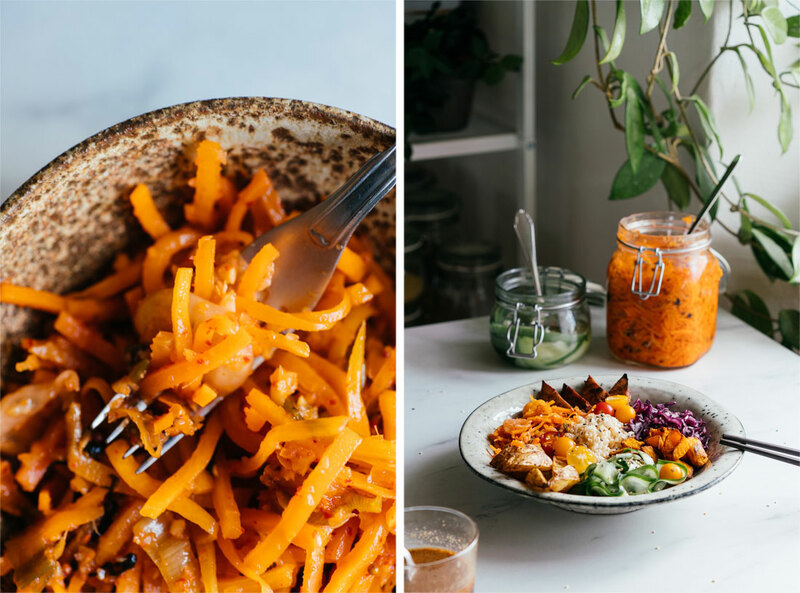 I’m still a fermentation baby myself but as per your request I shall keep sharing recipes andc thoughts on the process when I have something good going on. Divide your onion bulbs from the greens or if using spring onions separate the white part from the dark green. Place the onion bulbs cut into four pieces each or spring onion whites in a food processor. Add your peeled garlic cloves, ginger knob and salt before processing into a slightly grainy pasty. Place your carrot pieces. Slice the green parts of your onion and add to the bowl along with radish slices, gochugaru, nori crinkles and the paste you’ve just made as well as mustard seeds if using them. 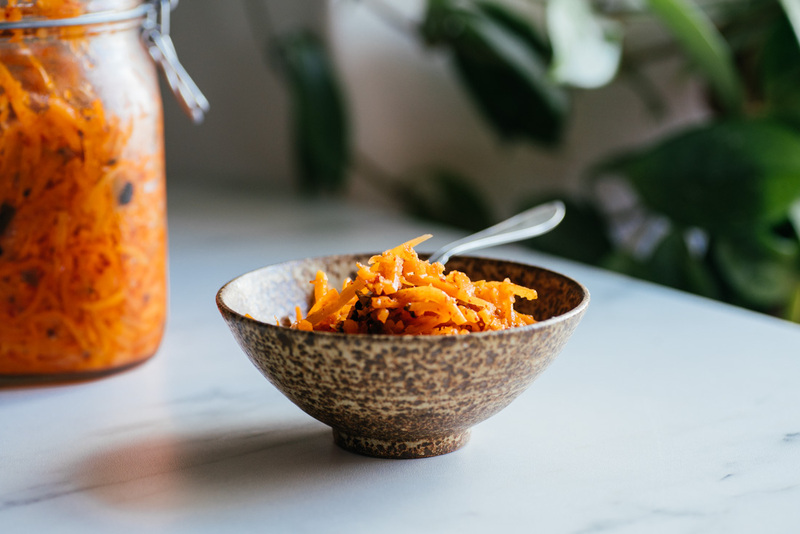 Massage the contents of your bowl until carrot softens a little and the mixture is very juicy. 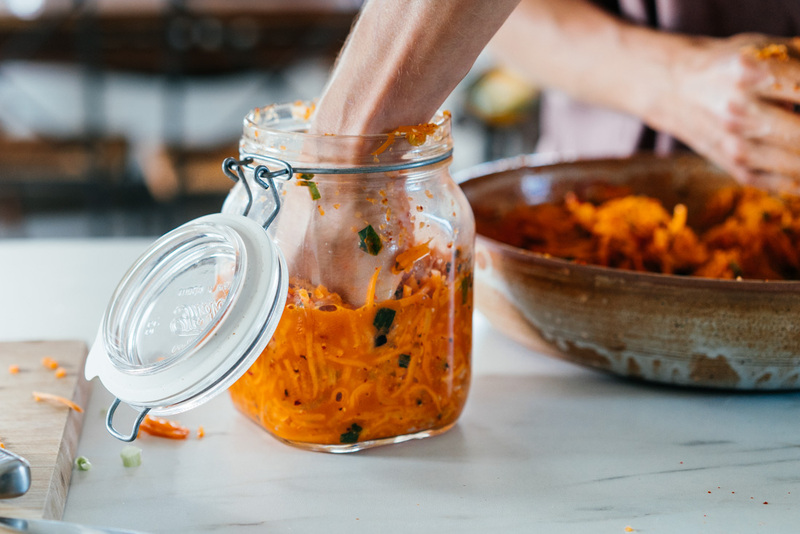 Press the carrot mixture into your 1,2 liter air tight glass jar firmly to ensure as few air bubbles are trapped among the mix. 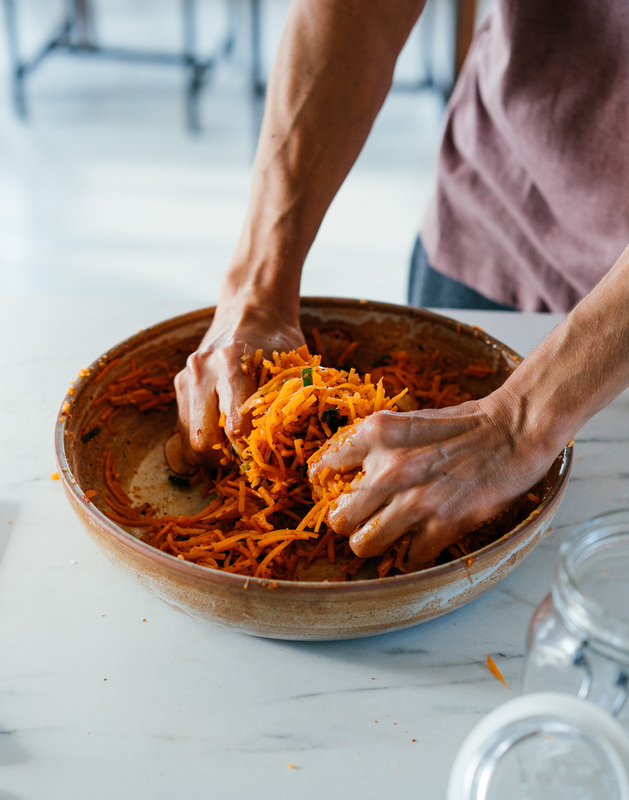 Also press down until juices flow over the surface of your carrots making sure they are covered by it. 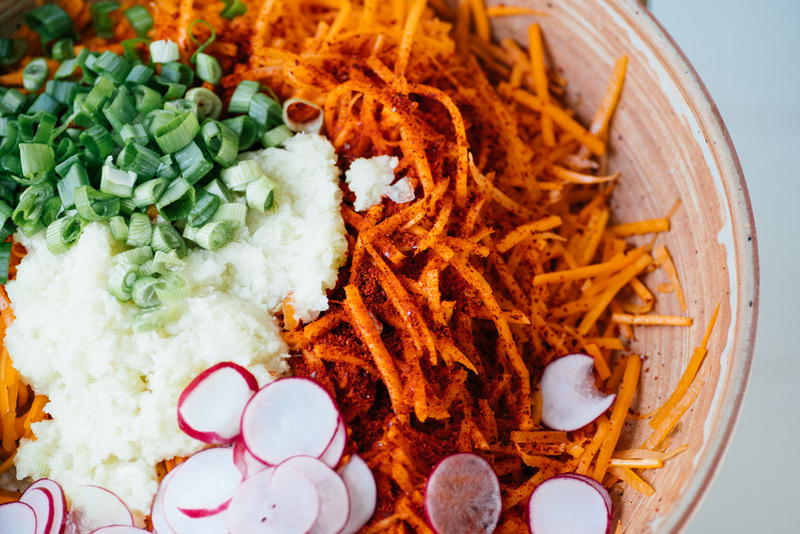 If your carrots are not covered by the juice you can add a little kimchi juice from a previous batch or with a little salted water. Seal the jar and leave somewhere out of the sun but not too cold, room temperature is perfect. You might want to open the lid once a day to let gases out of the jar, I opened mine to pushg the mixture down to recover with juice the first three days (more about this bleow). This will depend on your environment though so try it the first couple of days just to see if a lot of gas has gathered and if not, and your carrots remain covered by the juices, you do not need to do this. You can now leave your batch to ferment between five to ten days depending on your flavour preferences. Start tasting it after five days to see what you think. When it’s to your liking refrigerate and eat within a month (or way longer than that unless it seems a strange smell, taste or colour). 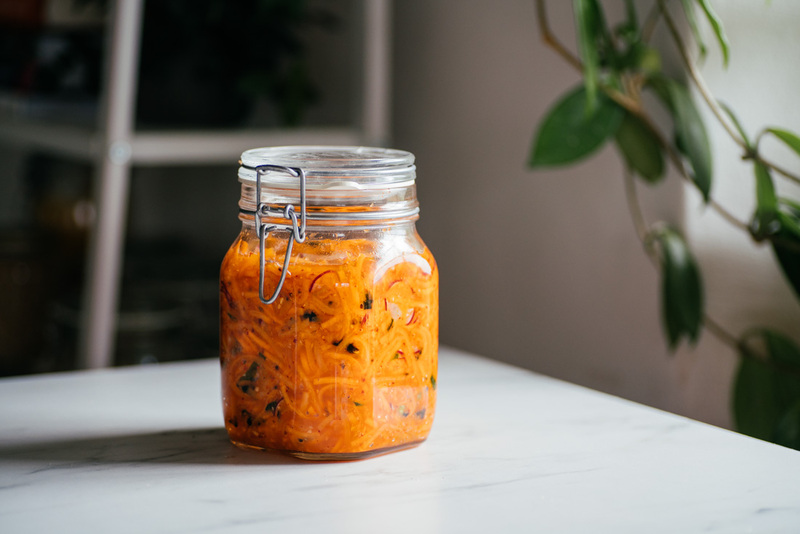 If your carrots seem to not be covered by the juices simply open the jar once a day roughly and press it down, this will mainly be necessary the first few days then the juices should be increasing. If they are not don’t be alarmed though, just keep on doing your thing pushing it down. You’ll know your kimchi has gone wrong if one of two things happen. The first one is if the kimchi smells very bad. 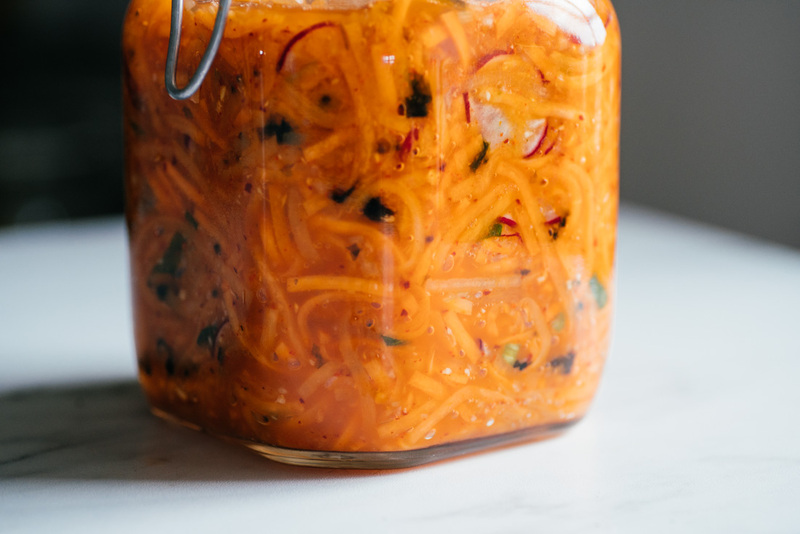 Kimchi has a pungent scent but it should not smell off, and from what I’ve heard it will really smell very off so don’t worry too much (it has never happened to me). 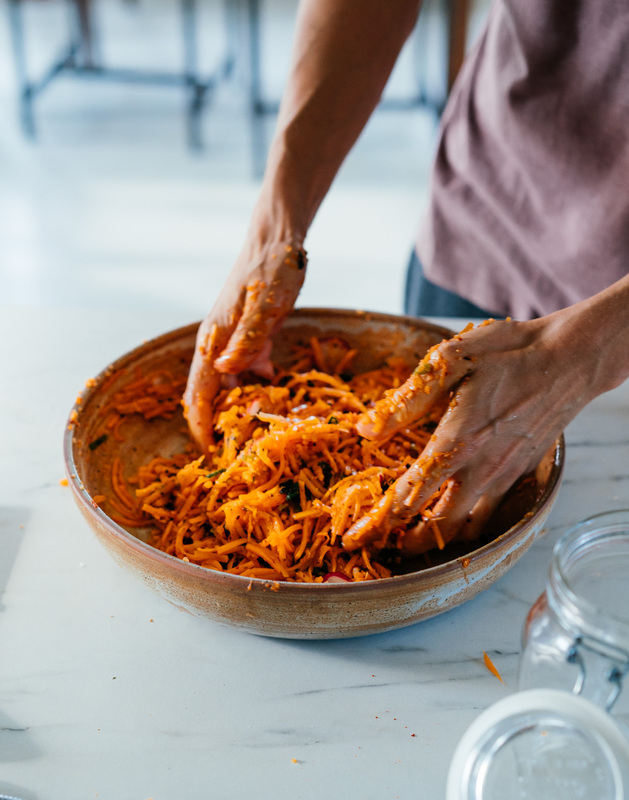 The other thing that could happen is mold forming or browning on top and this will mainly happen if your carrots (or anything else you’re fermenting) is not covered by the juices/salt water during the fermentation. If either of these happen discard the kimchi and start over! Hi, I love all your recipes and video styles! 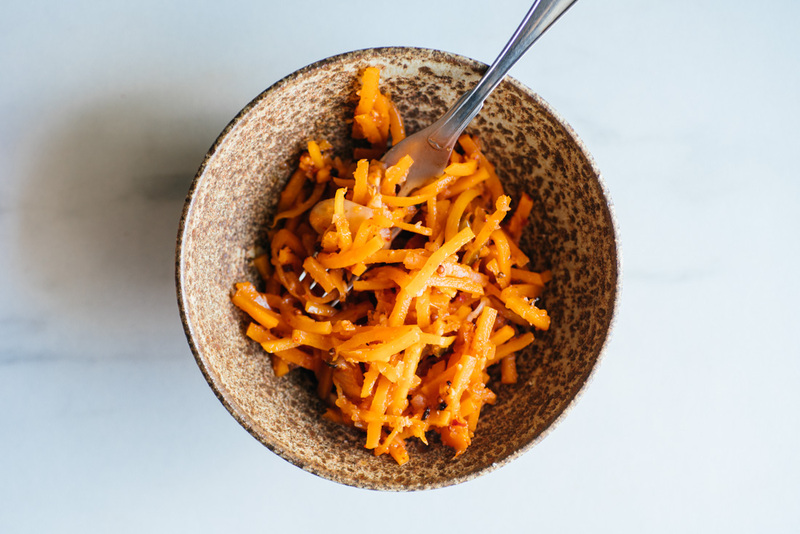 Can you make a video of how to make this wonderful carrot kimchi. I want to make this but a visual will help me be more confident. Thank you. I’ll happily make a video on fermenting carrots soon. It might take me a few weeks as I have some other videos planned but know it’s in the works. I’ve even asked a friend who’s quite the fermentation expert to come along and show us her best practices so stay tuned – it’s all coming soon.